Meghalaya, Aug 2 (Just News): As fear and anger run deep over Assam's citizenship issue, many of those left off the final draft of National Registration of Citizens (NRC) complain of being harassed at different places of neighbouring state of Meghalaya. "Centring the NRC, Bangalees are being tortured. Khasi people are intercepting them on different roads in Meghalaya," local daily Jugasankha reported yesterday. 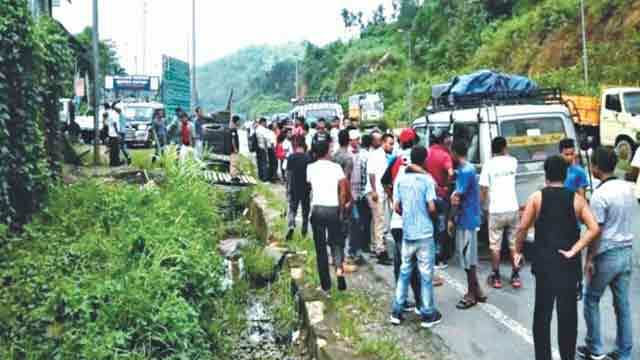 It said activists under the banner of Khasi Students' Union (KSU) were forcing people to get down from vehicles to check their nationalities. According to The Northeast Today, KSU has set up checkpoints in three districts and detected more than 1,000 “immigrants”. More than 200 “immigrants” were detected at the checkpoint at Pahammawlein, 20 Mile, in Ri Bhoi and were sent back to Assam, reported the daily yesterday. Later, local administration stopped the checking with assurance that necessary action would be taken and the union's demand for formation of entry and exit points would be fulfilled. Exclusion of many prominent people raised questions over the process maintained to prepare the NRC, final draft of which was released on Monday stripping around 40 lakh people of citizenship. Of those left out included close relatives of former President of India Fakhruddin Ali Ahmed. “Imagine I am the nephew of former President of India and my name is missing. We are worried,” said Ziauddin, son of Fakruddin Ali Ahmed's brother Ekramuddin, reported the New Indian Express. Prof Omar Saaduddin Ahmed, the great-grandson of Indian freedom fighter Bahadur Gaonburah, could not make it to the list as well. Gaonburah had participated in the 1857 Sepoy Mutiny in Jorhat and was imprisoned at the Cellular Jail in the Andamans. Assistant Sub-Inspector (ASI) of Assam Police Shah Alam Bhuyan has also been left out. Alam, who was attached to CM Sonowal until recently, was shocked after he found that his name was not on the list. Alam, who has been in the police service for 30 years, carried the tag of doubtful or 'D' voter until being cleared of it recently. Yet, his name did not figure in the NRC. His younger brother Chandu Bhuyan is an Army officer. The third brother Shilu is a commando in Assam Police and the youngest, Mukut, is a BSF jawan. Alam's son Babul Bhuyan is also a BSF jawan. Meanwhile, West Bengal Chief Minister Mamata Banerjee yesterday continued her harsh criticism of the citizens' list. “Bangladesh is not a terrorist state. It is a friendly country which is being insulted on the issue of illegal migration and infiltration. I am afraid this might affect the relations between the two friendly countries,” she told the media in the central hall of parliament, reported our correspondent in New Delhi. She made the comments right after meeting an array of top opposition leaders and BJP patriarch Lal Krishna Advani in their chambers yesterday. Bangladesh and West Bengal not only share the border but also share the language and culture, she mentioned and reiterated that the current issue might lead to bloodbath or civil war. A police case was filed against her in Assam for the comments. She said it was “wrong” to call all Bangladeshis “ghuspetis” (intruders), a term BJP President Amit Shah repeatedly used in his remarks to the media on Tuesday. Mamata said illegal migration was not an isolated or one-time issue or even one that only involves Bangladesh. "After the Partition, so many people came from Pakistan,” she pointed out. She said, "whoever is a BJP voter will be in the list of citizens... those who are not, will be deleted from the list... will you drive out everyone in the name of Bangladeshis?" the Trinamool Congress chief asked. Indian politics has heated up since the release of NRC with opposition bitterly criticising the ruling BJP for using it as political tool to increase vote bank ahead of the next year's election. Opposing them, the BJP claimed the move was to detect illegal infiltrators as per the instruction of the Supreme Court. Heated debates also took place in both Lok Sabha and Rajya Sabha over the issue.